Curry with rice and naan bread. On today’s show I discuss the magic of Indian food. This is such a varied cuisine loaded with spices, textures, flavors and so regionally diverse it all adds up to one of the worlds great cusines. In particular I discuss curry powder and some fo it’s uses and talk about making a spiced spinach called Palak Paneer. 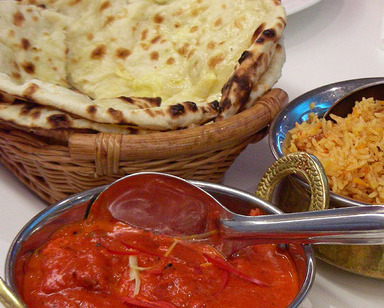 Indian food can be made at home simply once the spices used are understood and experimented with.